The Insignia-class is one of Starfleet's newest cruiser platforms. Originally conceived out of a need to circumvent the warp speed limitations of the 2370's, the class underwent several design changes that reflected continually changing design requirements. The final form of the vessel was quite different from the original conception, but has gone on to become one of the fleet's most capable craft classes. As early as 2368, there were already design and concept studies on a possible successor to the Galaxy-class spaceframe. Collectively known as Project Nova, the engineers from the Advanced Starship Design Bureau drew up four separate concept designs for possible successor designs. Ultimately, none of them progressed any farther then initial study models and work for successor designs to the Galaxy culminated in such designs as the Excalibur and Sovereign classes. However, one of the concept models would form the basis of another development project. The concept incorporated several revolutionary design features that the initial project engineers had seen as the logical future of starship development. The design called for a saucer section composed of of wedge shaped modular segments that could easily be replaced as mission demands changed and new technologies became available. Also, like the Intrepid-class, it incorporated Variable geometry warp pylons designed to permit optimization of field stresses during extended warp 8+ flight. It would be the variable geometry pylons that would bring the design that would one day become the Insignia-class from design study to deployed starship. Following the implementation of the warp speed limit in 2370, Federation engineers were searching for ways to overcome the damaging effects of warp fields on subspace. One of the earliest solutions to limit this damage was greater control of the warp field and the achievement of greater X-axis warp field compression. Variable geometry warp pylons were an easy, physical solution to reaching that level of control and field compression, so a general design brief for the Insignia-class starship was issued within months of the warp speed limit being implemented. As work moved beyond concept to serious design studies, the variable geometry system proved problematic for a design as large as the Insignia. Where the Intrepid-class spaceframe was a small, narrow design, the Insignia was a far larger craft in all dimensions which exponentially increased the problems of warp field dynamics. The project progressed on other fronts such as general systems, the inclusion of bio-neural systems, and the modular saucer design, but work on the variable geometry systems lagged behind other systems. By 2373 other advances in warp field theory had resulted in more standard warp nacelle designs to be able to overcome the speed limitations, and the variable geometry pylon became far less important in allowing Starfleet to operate at maximum effectiveness. There were those who advocated scrapping the Insignia design fully, but aside from design limitations regarding variable geometry the basic design was excellent. Its modular design would give Starfleet unprecedented flexibility unseen in even the Nebula-class and the spaceframe included many advanced systems that seemed to hold much promise. Given that Starfleet had already expended years of design effort, it was decided to continue with the craft's development process even though the original reason for the design brief, the variable geometry pylons, were no longer a part of or required by the design. Given that the optimization of field stresses of variable geometry would no longer be part of the design, the engineering team decided to address another conundrum that had faced warp designers for years. Warp field theorists had long believed that greater Y-axis compression of the warp field could result in far higher peak transitional efficiency. Preliminary testing in the 2360's had been unable to maintain a stable warp envelope with this degree of Y-axis distortion, but advanced research in high frequency subspace field modulation done by the Cochrane Institute of Alpha Centauri in June of 2373 had lead to breakthroughs in this area. The Insignia design team would work for several years to implement these new advances into their design, finally achieving success in the closing months of 2377. With the return of the USS Voyager from the Delta Quadrant in 2378, the design team took full advantage of the new systems and technologies discovered by her crew. Voyager had brought with it several new and until this point undiscovered technologies, and those not restricted by treaty or temporal concerns were jumped on by the design team. 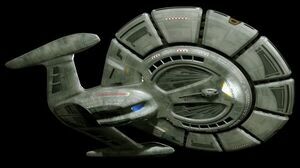 The Insignia-class became the first Starfleet design to incorporate those technologies in as core systems as opposed to refits or other post-production add-ons. By the time the Insignia-class completed trials and deep space assessments in early 2381 she was by far one of the most advanced craft in service. The class leader USS Insignia was commissioned on July 23rd, 2381 and her sister ships of the initial production order followed within the year. The Insignia-class entered service as the ultimate multi-purpose craft. The modular saucer segments provided a flexible platform that could adapt itself to a variety of different roles. While the modules are not as easily changed out as a Nebula-class pod, they provide a way for Starfleet to create craft from the same basic platform that can fill a multitude of different roles. In addition, the spaceframe could be retasked to those different roles with dry docking procedures that were substantially less time intensive then a full refit. The class can be completed in specialized configurations to support scientific, tactical, or even marine missions. However, most Insignia-class ships are built to a mutli-mission configuration to provide a well rounded platform for Starfleet exploratory missions. They have mostly been deployed to supplement and replace the aging Ambassador-class vessels in its role as the fleet's multi-mission Heavy Cruiser, acting in a similar role to the larger Explorer type craft. The Insignia class incorporates a modular design in its saucer allowing for mission-specific duty modules that are swapped for a variety of missions. This page was last modified on 3 April 2019, at 00:49. This page has been accessed 14,725 times.